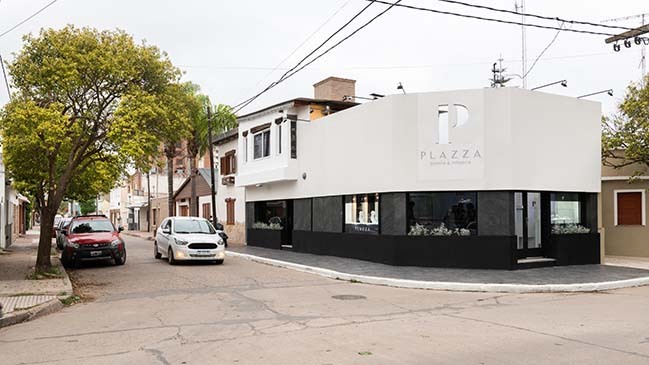 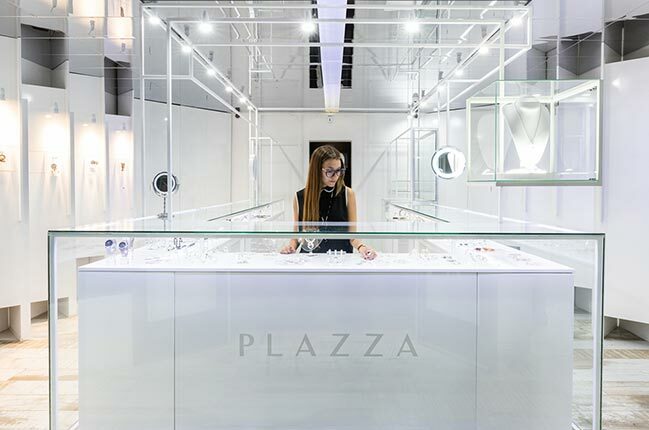 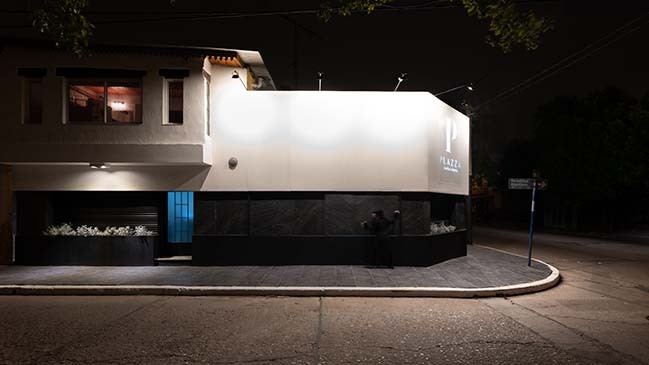 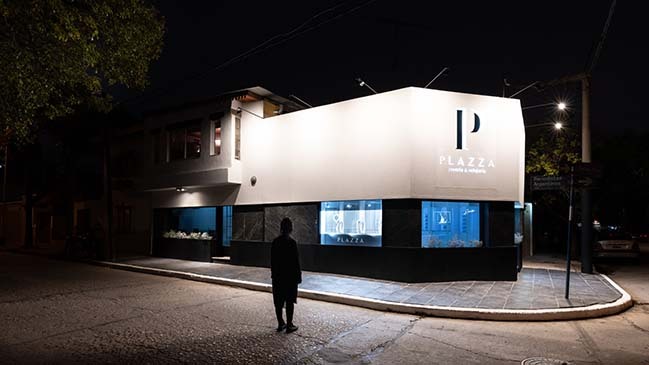 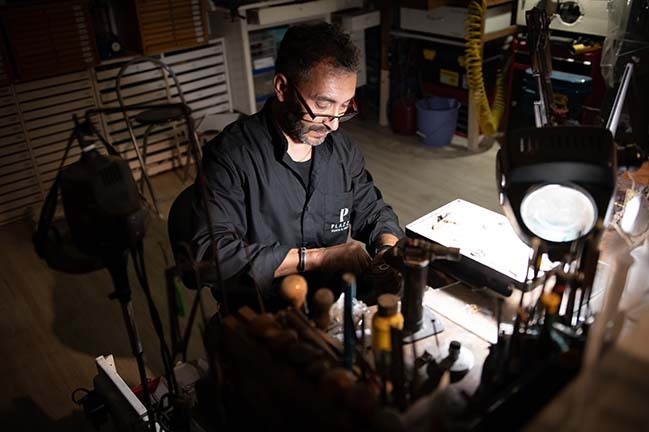 Located in a busy corner in the city of Villa Maria (Córdoba) since 1963, Plazza has been a jewelry and watchmaking store that remains the same since it’s beginning. 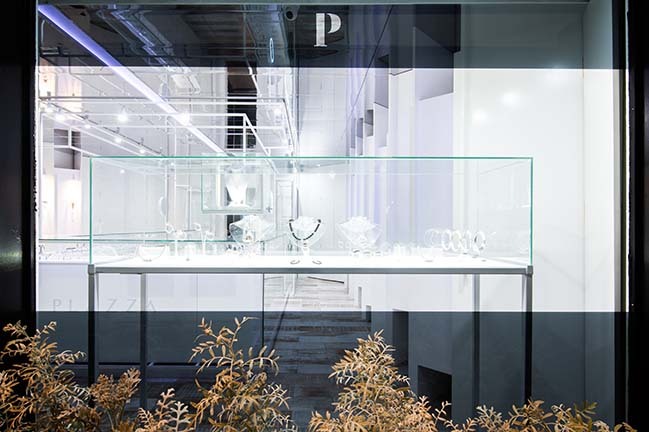 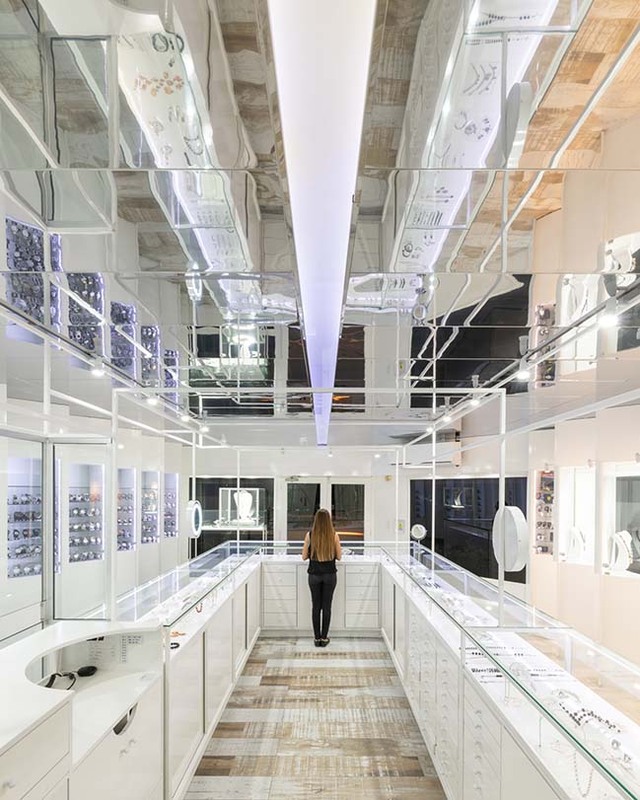 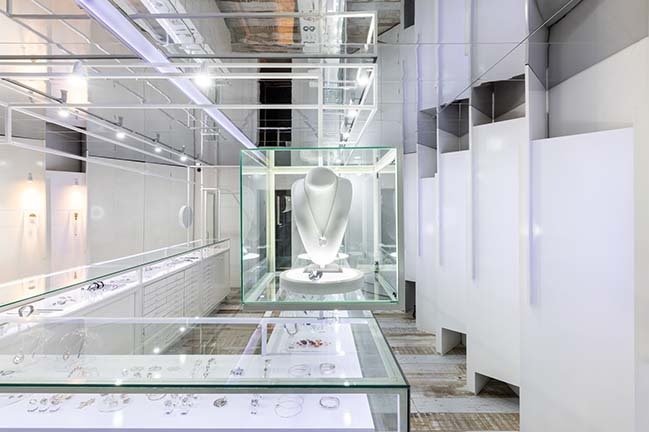 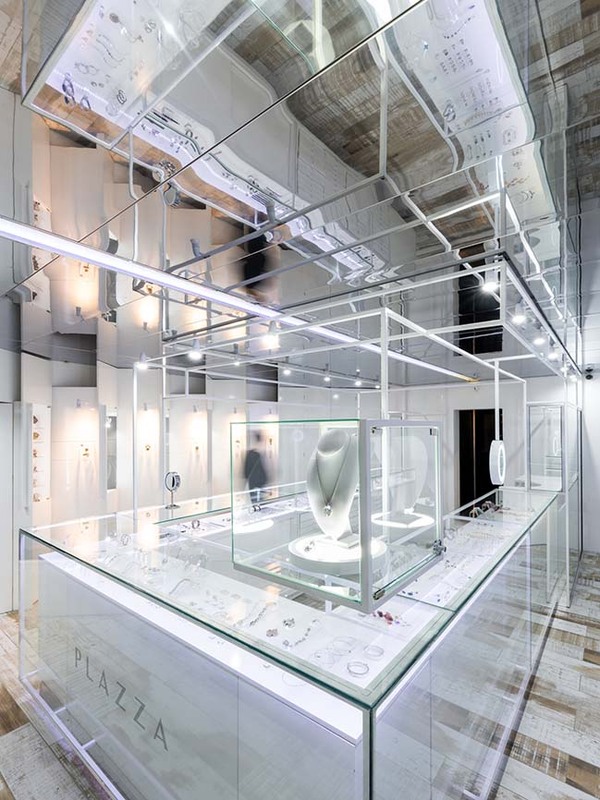 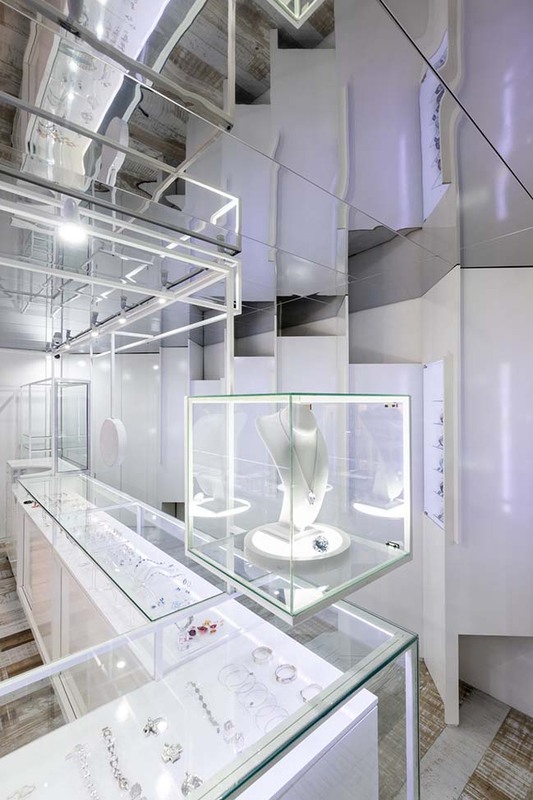 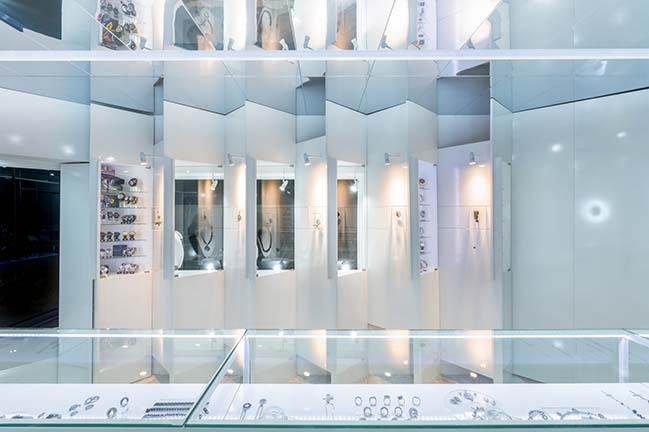 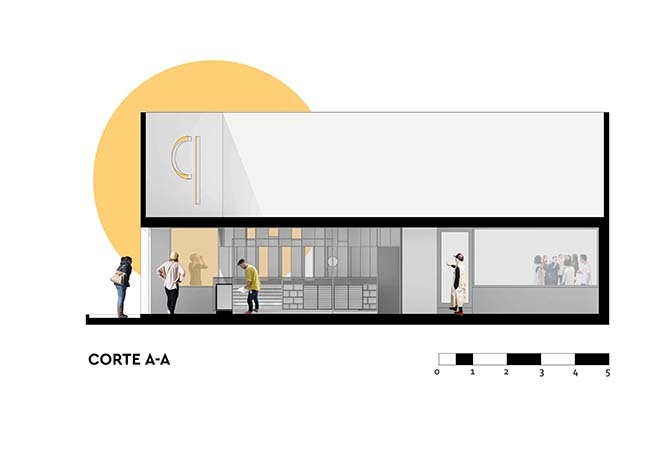 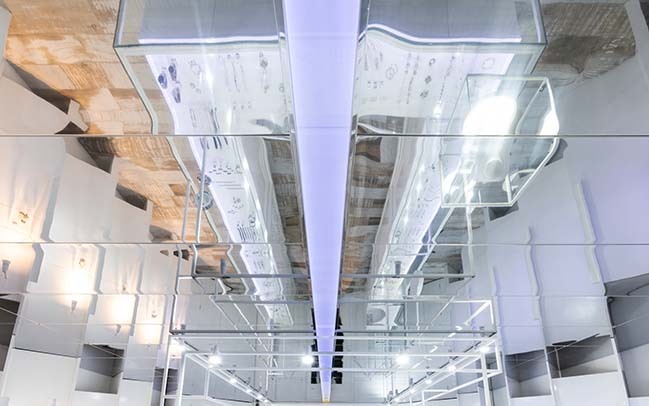 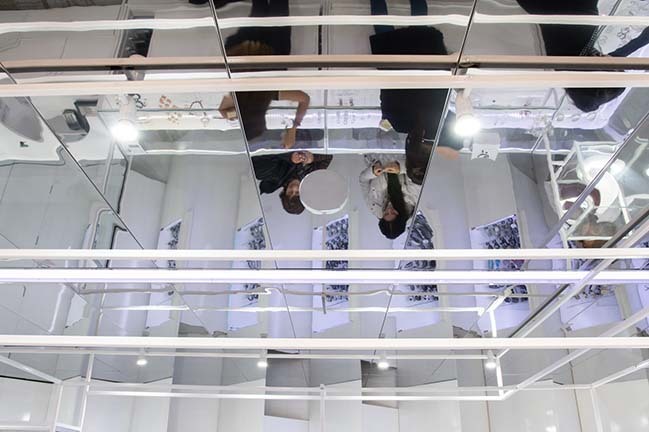 The project proposes a renovation of the whole property (interior and exterior) through the premise of a space that identifies the vision of three generation of jewelers, trying to create a new brand identity that merges origin and future. 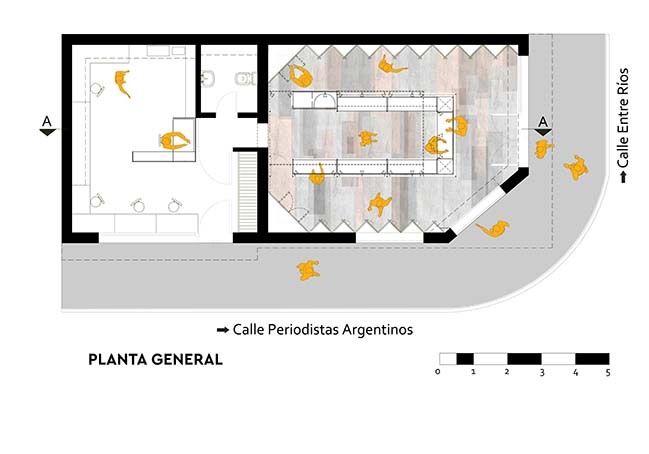 From the architect: In just 39m2, the project strategy is solved through a hybrid game between space / function- of position, perspective and circulation. 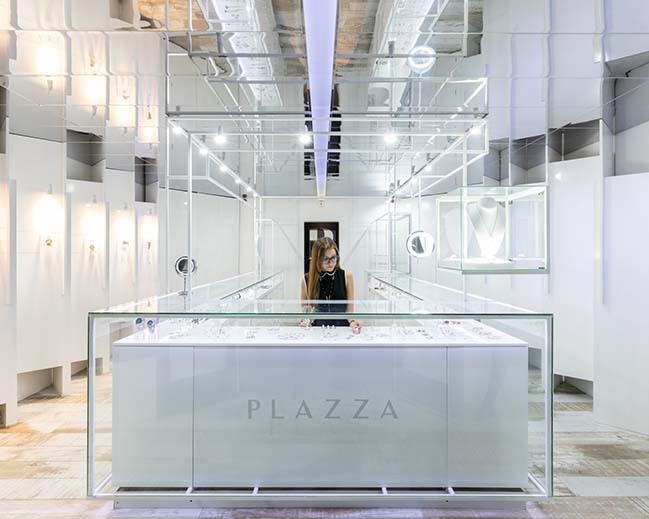 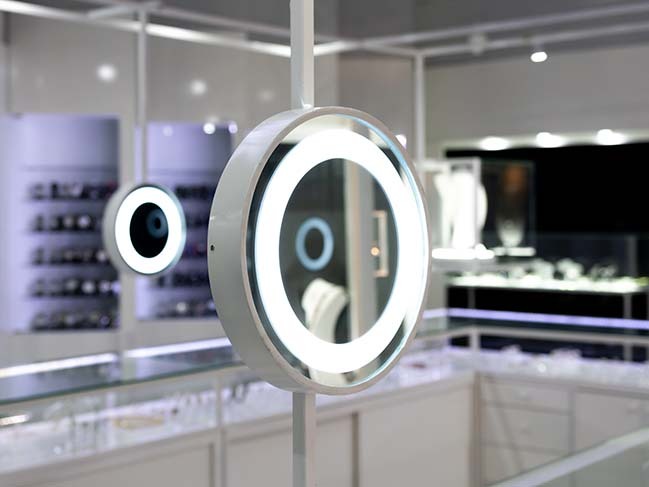 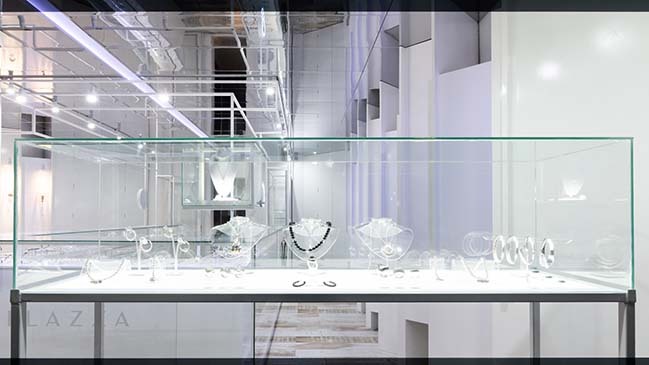 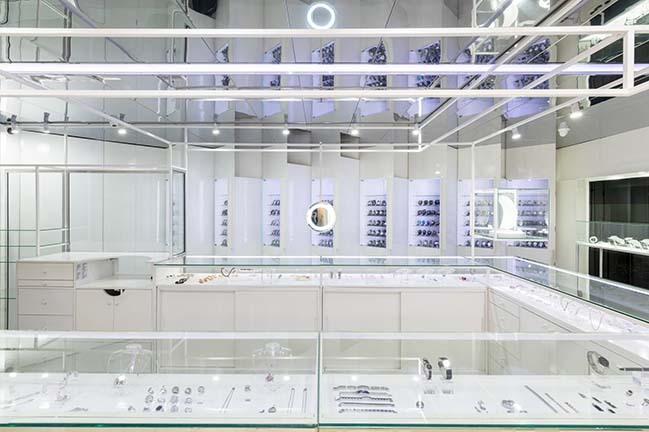 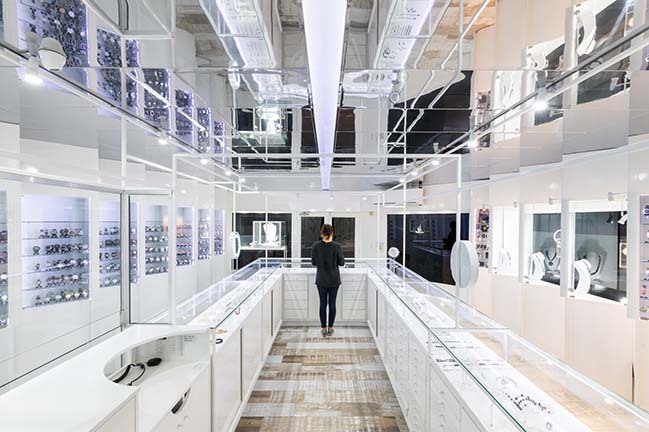 When the customer enters the shop, he visualizes a central counter that brings together the jewelry area as an iconic element. 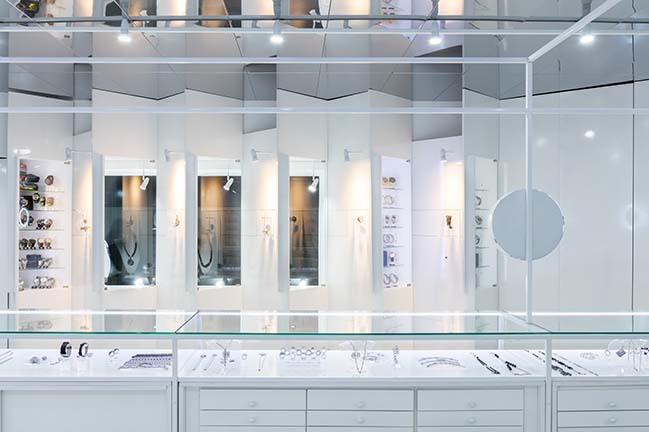 This centralized arrangement focuses and highlights the main product for sale, and it guides [and gives direction to] the movement of customers inside the premises and reinforces safety protocols, an essential requirement in this business. 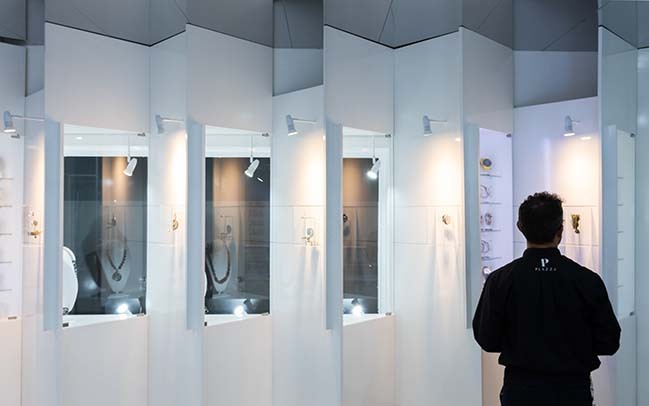 The perimeter walls are fully used for product display. 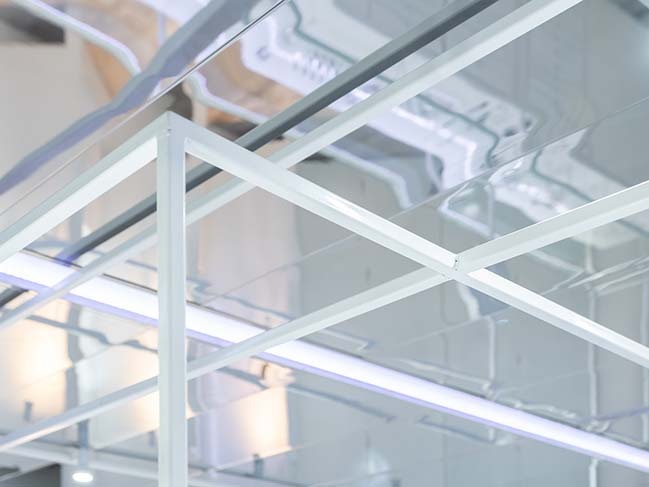 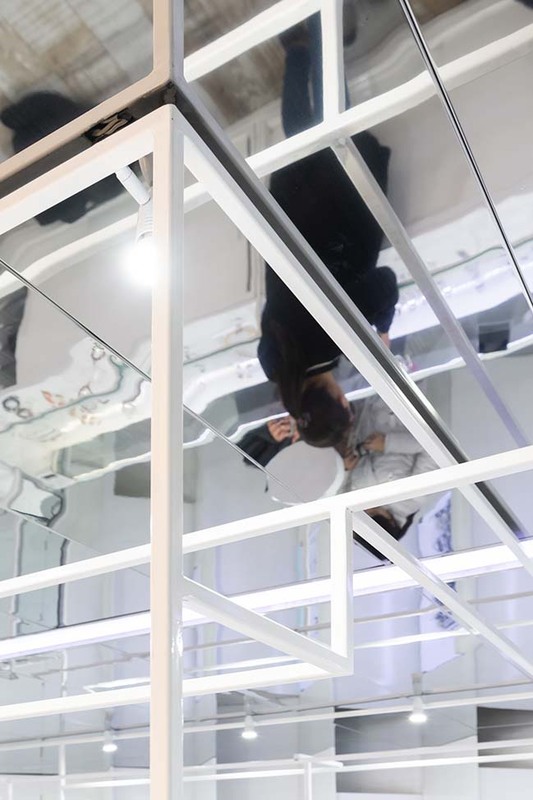 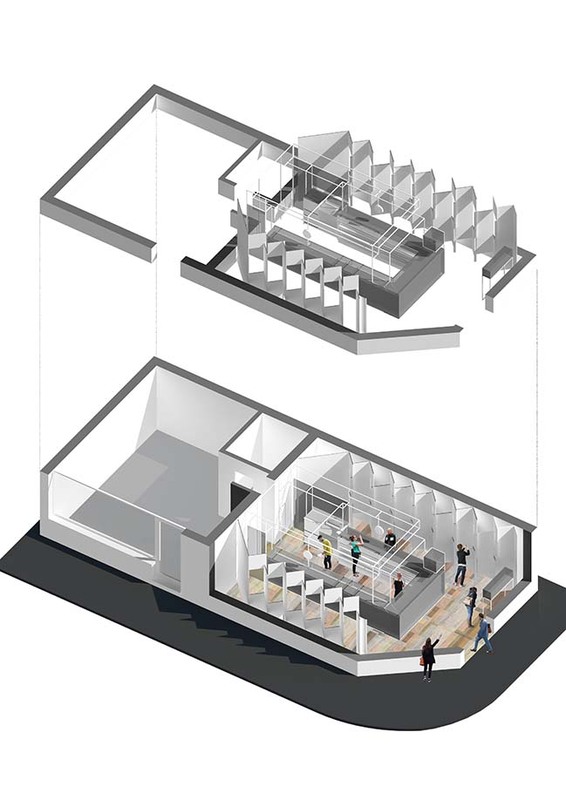 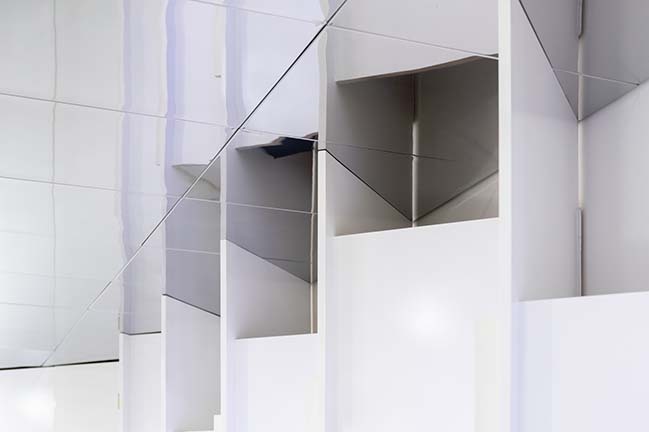 It has been solved by a series of superimposed and recessed planes, arranged with an axis of rotation at 45º on which is developed a continuous geometry that provides an exhibition path to a gallery mode. 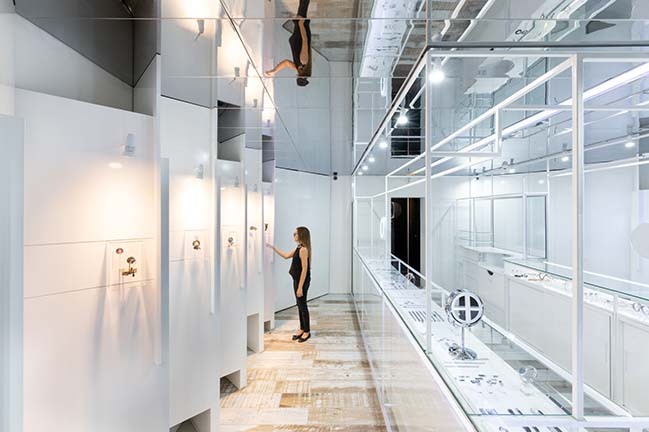 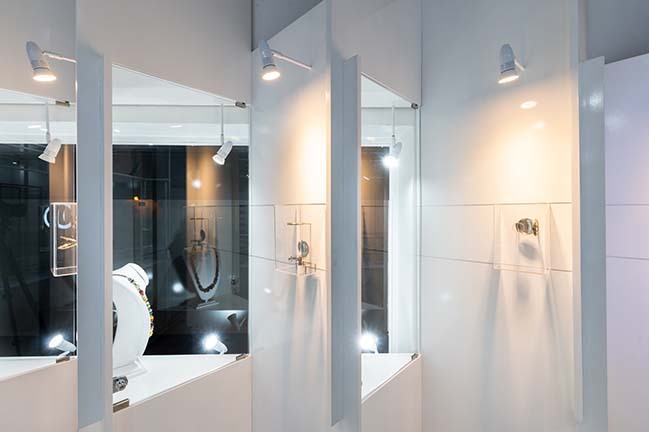 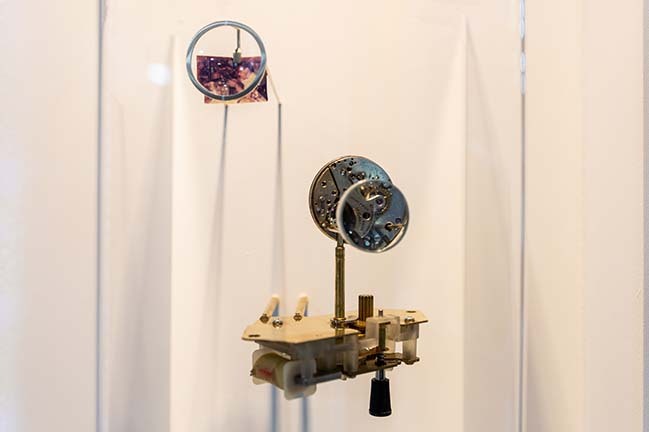 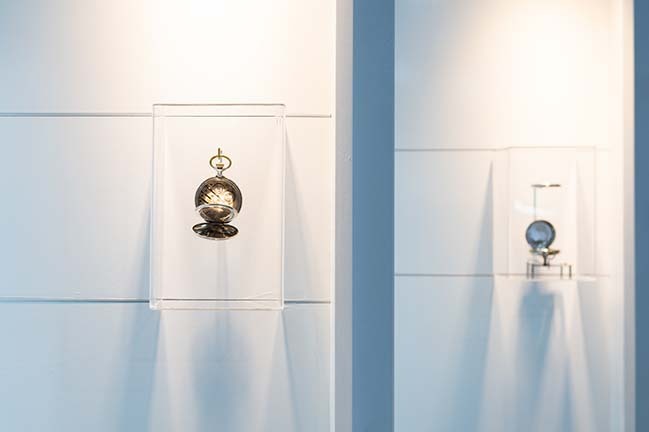 To strengthen this concept, with the goal and client requirement to incorporate into the design a collection of pocket watches owned by the client, enclosure walls were used to place a series of sculptural devices designed by the plastic artist and jeweler Rocío Moreno. 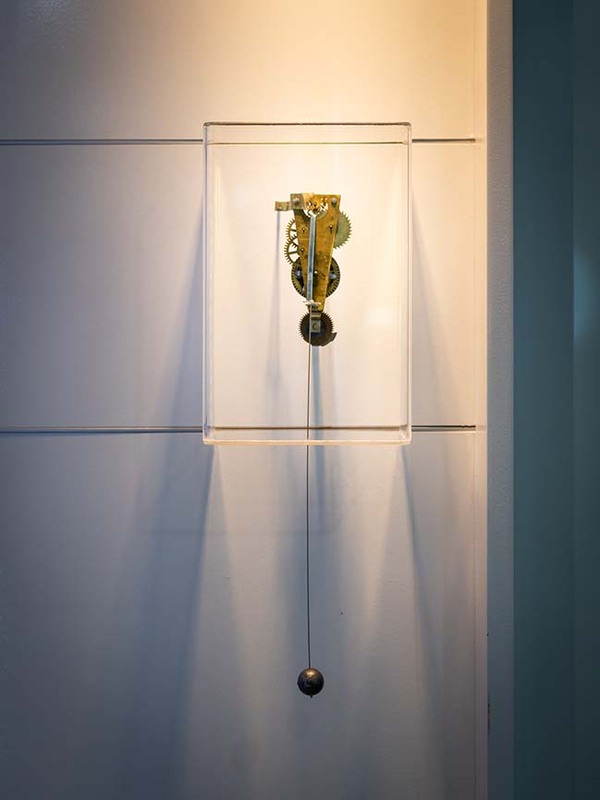 The path of time’s visualization concept where materials and light are merged from movement and perspective complements and acts in perfect symbiosis with the rest of the intervention. 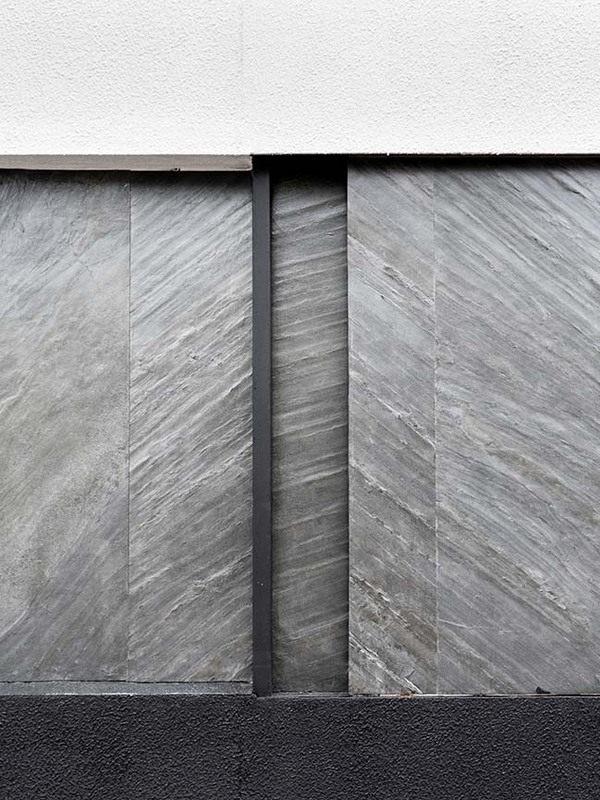 Finally, the facade is divided into two big monochromatic skirting boards. 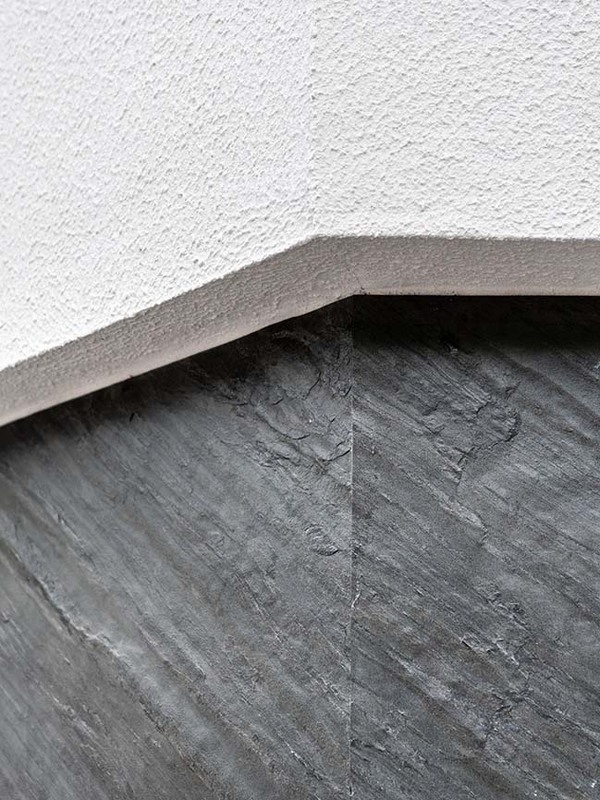 In the lower one trim stone is used, a flexible natural stone coating where each store sheet is different and unique creating texture, detail and elegance. 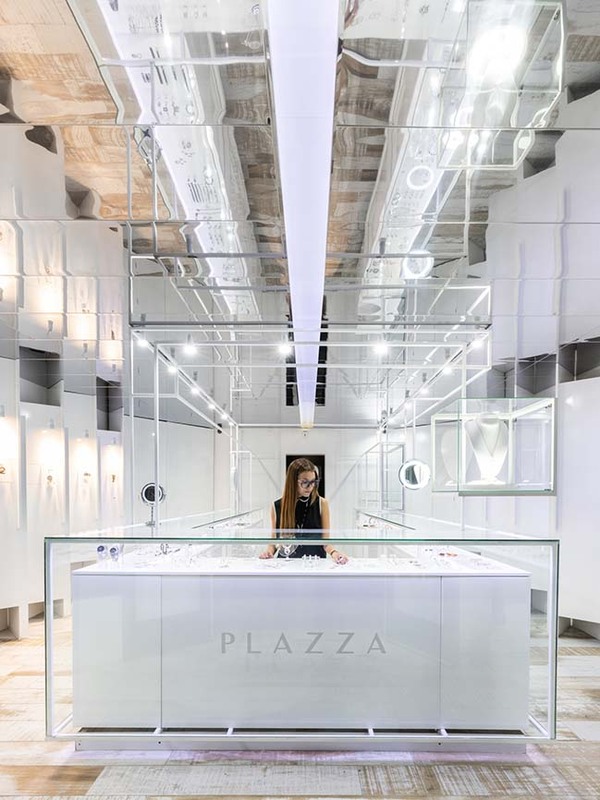 This stripe breaks through and it contrasts and interacts with the immaculate white of the interior setting the rhythm of support for the showcase. 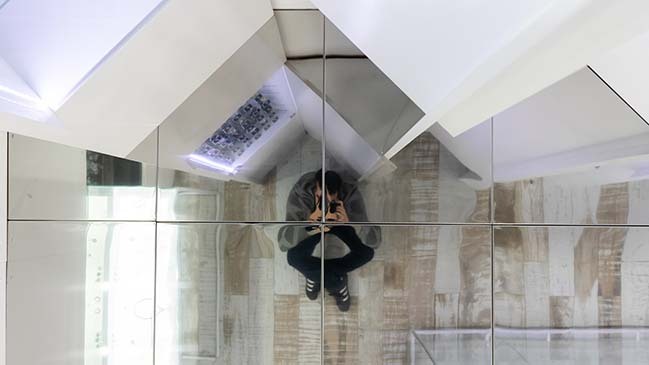 The upper plinth’s function is to confer scale and frame to the isologotype located strategically at the corner. 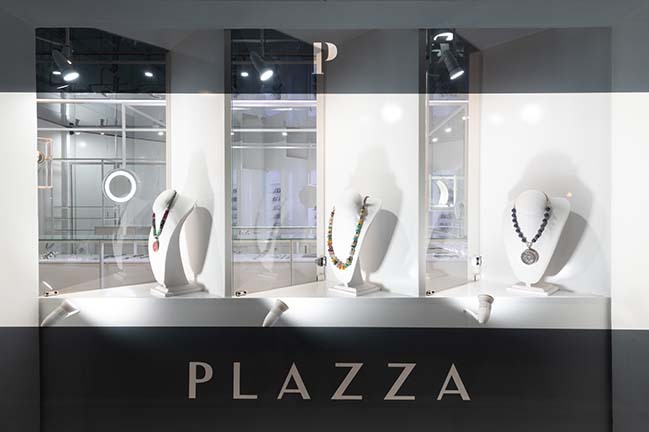 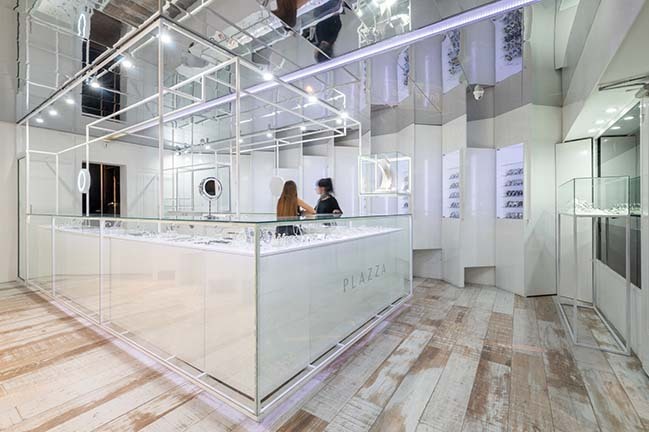 PLAZZA reflects and summarizes trade, product and architecture in a combination of practicality, usefulness, synthesis and expression.